Matt: Royals’ ace “Big Game” James faced the Athletics’ recently hired gun Jon Lester for the right to advance to the ALDS. Shields started the game with a whimper, allowing a monster two-run blast to Brandon Moss in the top of a first inning. After a back-and-forth game that included a five-run Oakland sixth, the Royals entered the bottom of the ninth down by a run. A pinch-running Jarrod Dyson advanced to second on a sacrifice and stole third before scoring on a sacrifice fly, sending the game into extra innings. Oakland scored again in the top of the 12th but Kansas City battled back again, scoring a pair of runs thanks to September call-up Christian Colon. In a game in which their win expectancy dropped as low as 2.9%, the Royals pulled off a miracle and set off to face the Angles in the ALDS. If you haven’t seen the game, go watch it. If you’re a Royals fan, go watch it again. Darius: The Wild Card game was a lot less nervewracking than it could have been. Despite a good season, Edinson Volquez was not the kind of pitcher who scared you, much less when Madison Bumgarner was on the mound. Although the early innings were tense, Volquez did not look as though he had his best stuff and once Brandon Crawford launched a grand slam in the fourth, the game felt about as over as a game can feel in the fourth inning. Bumgarner cruised to the complete game shutout. Matt: While the Royals never faced as steep a deficit in the ALDS, the series was not light on drama. Both of the first two games went into extra innings. The two most prominent members of the “best farm system of the decade” would win them those games, with Mike Moustakas homering in the 11th of Game 1 and Eric Hosmer finishing of Game 2. The Royals finished the series with a sweep in front of their home crowd in Game 3. Despite giving up another first-inning home run, Shields earned a win on the strength of a Royals offensive breakout, sparked when Gordon cleared the bases with a first-inning double. Moose and Hosmer each added their second home runs of the playoffs, and the Royals cruised to an 8-3 victory. Darius: The Nationals series was a very different proposition compared to the Wild Card game, as I felt they were a better team in almost all aspects. With excellent depth in both their rotation and lineup, there were no obvious weaknesses for the Giants to capitalise on. It was therefore unsurprising that the 3-1 series victory came with no small amount of luck, as well as spurts of great pitching, in three one-run ballgames. The highlight was a ludicrously long Game 2, a game that lasted 18 innings and was only prolonged by some ninth-inning heroics from Pablo Sandoval after Matt Williams’ much-debated decision to pull Jordan Zimmermann in favour of closer Drew Storen. Brandon Belt’s game-deciding blast was the only Giants home run of the series, a theme that would continue into the NLCS. Matt: In the ALCS, the Royals faced the Baltimore Orioles, who were also well rested after an impressive sweep of the Detroit Tigers. The series was pitched as the speed of Kansas City — who had run all over the A’s and Angels, stealing 12 bases in 13 attempts — against the power of the Baltimore Orioles, led by regular season home run leader Nelson Cruz (40). The series played out quite differently with the Royals being mostly shut out on the base paths, managing only a single steal in two attempts. Despite only 95 regular season home runs, the Royals clubbed four in the ALCS, with three coming in a dramatic 8-6 Game 1 win. The Orioles on the other hand hit only two home runs and managed a total of 12 runs to the Royals 18. The Royals sweep would bring the back-end of the Royals bullpen to prominence with spectacular performances from Hererra (who returned from a forearm injury scare in the ALDS), Wade Davis, and Greg Holland. The trio earned the collective nickname “HDH” and combined to allow just a single run in the series over 14.2 innings while striking out 15. Davis would notch two victories while Holland would earn a save in each of the four games. Despite a total of four extra-inning games and another that was won in the top of the ninth, the Royals had swept their way through the American League to the pennant. Darius: The series against the Cardinals was again full of close games, with errors, sacrifices and general good fortune seeming to play the most significant part in San Francisco’s run-scoring. Kolten Wong’s new-found ability to record an extra-base hit every time he came to the plate became the main source of concern for the Giants. But after Game 3, when Randy Choate threw away Gregor Blanco’s bunt to allow San Francisco to walk off in the tenth inning, I couldn’t help but have the feeling that it really was our year. More good fortune followed in the sixth inning of Game 4 as infield misplays by the Cardinals allowed the Giants to take a decisive 6-4 lead. That power finally showed up in Game 5 with three home runs, as Joe Panik got the Giants on the board, pinch-hitter Michael Morse tied the game in the eighth and Travis Ishikawa dealt the walk-off blow to send San Francisco to their third World Series in five years. Matt: For many Royals fans, appearing in the World Series felt a bit like playing with house money. The Royals didn’t exactly squeak into the playoffs but few were the fans who thought they would advance to the final round. However, in the Giants, the Royals found an opponent with one fewer win in the regular season, and thanks to an AL All-Star Game victory (this time, it counts! ), home field advantage. The Giants wouldn’t be pushovers, but the Royals looked to have a real shot to #TakeTheCrown. The World Series was bookended by Madison Bumgarner, and when he was on the mound it felt like the Royals would never score another run. In between those appearances, the Royals delivered moments that fans will never forget. Sal Perez and Hunter Strickland getting into it after Infante and his busted shoulder took Strickland deep in Game 2. The six-run second inning of Game 6, when it seemed like the Royals could hit any pitch for a double. The two-out single so badly misplayed by Gregor Blanco that Alex Gordon advanced to third. In the end, the Royals came up just short. No Commissioner’s Trophy. No World Series Championship gear. No champagne showers. No ticker-tape parade. No DVD boxset of the season. But for two months in the fall of 2014, Royals fans had something that they hadn’t had in 29 years. Hope. Right down to the last out. Darius: Once the Giants reached the World Series, I actually felt as though we had the better chance of winning. I had enjoyed watching the Royals’ playoff run and I certainly worried about their formidable bullpen in a close game, but I thought we had the better lineup and comfortably the best pitcher in Madison Bumgarner. I had no idea how much he would ultimately factor in to the outcome of the series. Game 1 set the tone as Pablo Sandoval and Hunter Pence put the Giants 3-0 up against James Shields in the very first inning and Bumgarner started what would be a record-breaking series with seven innings of one-run ball. All three would be outstanding throughout the series, with at least one of the three seeming to play a part in almost every key moment. The concern really came when any starter other than Bumgarner was on the mound, as they seemed almost incapable of missing Kansas City bats. The nine earned runs surrendered by Jake Peavy in just 6 1/3 innings, spread over two starts, were the prime example of a rotation that would have sunk San Francisco if not for Bumgarner. Despite a shoulder injury, Omar Infante provided a spark in multiple spots for the Royals, while Wade Davis and Greg Holland shut down San Francisco when they needed runs late in games 2 and 3. After four games, the series was locked at 2-2, setting the scene for Bumgarner to take over. 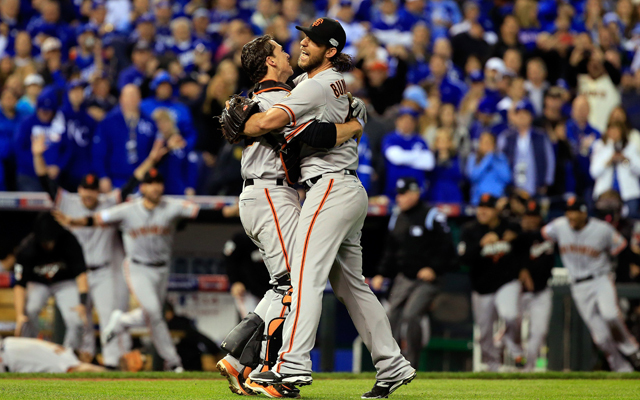 His shutout in Game 5 settled nerves heading back to Kansas City, but another Peavy disaster led to a Game 7 decider. It was expected that Bumgarner would come out of the bullpen if needed; that proved to be the case as soon as the fifth after Jeremy Affeldt had rescued the Giants from Tim Hudson’s disappointing start. I could never have predicted the left-hander’s incredible five-inning, 68-pitch relief appearance that secured a third World Series victory in five years for San Francisco. Gregor Blanco’s error that allowed Alex Gordon to reach third – and almost break for home – nearly gave me a heart attack, but Bumgarner tossed a series of high fastballs to Salvador Perez, eventually inducing the popup that gave him the ending he deserved: a World Series title and the MVP award to go with it.